Are Quartz Countertops Right for You? 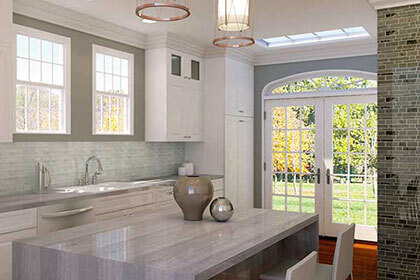 quartz countertops just might be the best choice for your kitchen. quartz countertops are not indestructible, but they are quite durable, and they manage that while being nearly maintenance-free, unlike other materials used for countertops. One of the great things about quartz countertops is that they are low maintenance. When you choose quartz, you don't have to worry about sealing your countertops every few years like you do with natural stone. Quartz is also non-porous, meaning it won't stain if you spill something on it. However, there are some things you should remember when caring for your quartz countertops. Quartz countertops are nonporous, so most things you spill on them will sponge right off without staining the surface. There are a few exceptions, however, so always clean up spills promptly. Furthermore, being nonporous means they are also more sanitary, as it is more difficult for bacteria, mold, mildew and germs to grow. Add to that the fact that the major brands of quartz countertops have been certified as low-emitting, and you have a product that is good for the planet as well as your family's health. We have a great selection of quartz countertops, we pride ourselves with the personal attention and detail we devote to each project. Come in to choose your perfect quartz countertops today!